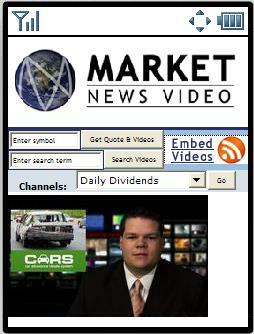 Market News Video on the web is a great site for investors, particularly in U.S. and Canadian markets. It hosts dozens of timely video reports including market summaries, company profiles and daily upgrades, downgrades and dividend reports. Videos are updated throughout the day. They are average a minute in a half in length. Production values are first rate and the clips are interesting and informative. There is text reportage too if video is not your thing. The mobile site, which is new, has most of the content of the desktop edition. It is billed as supporting the iPhone and video capable BlackBerries. It works well on the target devices. However the site’s videos refused to play on either of the two other phones I tried, a Nokia N95 and a HTC Ion Android phone. The problem seems to be with the browser detection. BlackBerries get a page with links to streaming 176×144 mpeg4 videos. The iPhone version has an embedded Quicktime player. The problem is that the site seems to serve unrecognized handsets the iPhone page, which is unlikely to work on anything but an iPhone. If it were to default to the Blackberry format for everything except the iPhone, the clips would be playable on most video capable phones or least the ones which can handle the site’s rather large, for mobile, page size of over 160 KB. This entry was posted in Finance and tagged BlackBerry, finacial news, iPhone, mobile site review, Video by Dennis Bournique. Bookmark the permalink. If you read the post you would know that I couldn’t get the videos to play on my Symbian N95 either. I just tried again with an N8 and they still don’t work. How can i play these videos on my Symbian Based Nokia X6. I’m also looking for a software from where i can get Real Time Stock Market updates.